Bill Moyers sent a camera crew to Eisenhower Foundation hearings in Detroit and Newark. Thirty five years ago, as part of the President’s National Urban Policy, a youth employment and crime prevention initiative was launched that the Foundation later built upon to create the multiple solutions to multiple problems in our present inner city programs and evaluations. 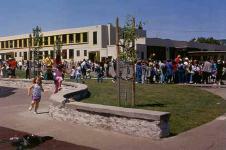 Click here for the National League of Cities article on the original Urban Initiatives program. After the December, 2012 massacre of 20 first graders and 7 adults in Newtown, Connecticut, The Washington Post published a letter by Eisenhower Foundation President Alan Curtis. This letter responded to an op-ed by Joseph A. Califano, Jr, in the Washington Post on December 17, 2012. Click here to read the letter by Foundation President Alan Curtis. Click here to read the op-ed by Joseph A. Califano, Jr.
Click here to go to the Foundation's Firearms Violence Prevention Portal . The New York Times published a letter on September 18, 2012 by Foundation President Alan Curtis on how the Foundation’s Quantum Opportunities program build character among inner city high schoolers who are at risk of dropping out. 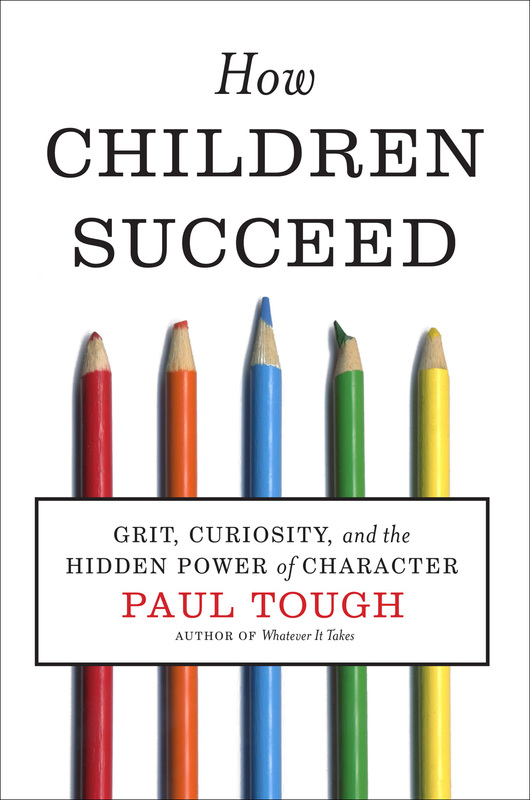 Quantum incorporates many of the kind of interventions advocated by Paul tough in his book How Children Succeed. Read what Clarence B. Jones says about income inequality, the Kerner Commission and Michael Harrington, in his "The Other America". Click here to read his article in the Huffington Post. In October 2010, at the Kellogg Foundation Conference Center at Gallaudet University in Washington DC, the Foundation held a three day national workshop to train and technically assist twenty new replications of its best practice Safe Haven-Ministation, Quantum Opportunities and Argus Training Models. The life of the late Elizabethy Sturz, an Eisenhower Foundation Trustee, led to her founding the Argus Learning for Living Center on East 160th Street in the South Bronx. Argus is a model for policy that gives priority to job training first, rather than work first, for high school drop outs and exoffenders. The Foundation now is replicating a new generation of Argus job training and placement initiatives. Read about the new Argus initiatives. Read the life history of Elizabeth Sturz. 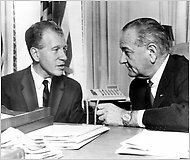 The life of David Ginsburg, an Eisenhower Foundation Trustee, led to service under President Roosevelt and President Johnson. Mr. Ginsburg was Executive Director of the 1968 Kerner Riot Commission. Read about the Eisenhower Foundation's forty year Kerner Commission Update. On March 26, 2009 Eisenhower Foundation President and CEO Alan Curtis spoke to the City Club of Cleveland on the findings of the 40 Year Update of the Kerner Commission. Nearly 100 years old, the City Club is the longest-running forum of free speech in America. Past speakers have included Theodore Roosevelt, W.E.B. DuBois, Franklin Roosevelt, Rosa Parks, Jimmy Carter, and (the day after Dr. Martin Luther King was assassinated) Robert F. Kennedy. Dr. Curtis' presentation was sponsored by Policy Bridge, Inc. and cosponsored by the Center for Families and Children; the City of Cleveland, Office of Minority Health; the Cleveland Branch of the NAACP; the Council for Economic Opportunities; the Neighborhood Leadership Institute; and Youth Opportunities Unlimited. Click here to see a video of Dr. Curtis' presentation. 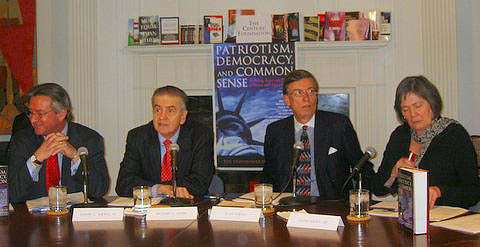 On April 16, 2009 Eisenhower Foundation President Alan Curtis spoke before the New Hampshire Institute of Politics at St. Anselm College, noting that it has long been the position of the Foundation that only programs that work should be supported, and that this is best demonstrated when careful evaluation of programs occurs. Click here to see a video of Dr. Curtis' presentation. On November 13, 2008 the Eisenhower Foundation and the Economic Policy Institute held a forum to assess our nation's progress over the last forty years and, more important, to discuss what is still left to do to move us closer to economic equality. On Friday, October 3, 2008 at Stanford University's Tresidder Union, the Eisenhower Foundation joined with the Stanford University School of Education, the Civil Rights Project, the Warren Institute, and the Education and Public Interest Center to host a daylong forum to commemorate the 40th anniversary of the Kerner Commission report and to bring attention to issues of educational inequality. This event featured plenary sessions and a townhall meeting. It focused on education as the means to reduce poverty, inequality, racial injustice, as articulated by the Kerner Commission. Click here for more information. The Eisenhower Foundation is hosting a re-examination of the issues raised by the Kerner Riot Commission, beginning with forums in Detroit and Newark, two cities affected by the civil unrest of 1967. Read what the media says about these two public forums. The purpose of the Forum was to provide information that the Eisenhower Foundation could use in its fortieth anniversary update in 2008 of the final report of the 1968 Kerner Riot Commission. The June 6 Paris Forum, on the anniversary of Europe D-Day, 1944, compared the causes and consequences of the uprisings in America’s impoverished inner cities during the 1960s, 1980s and 1990s to British riots in the 1980s amongst its urban poor, (which led to a British Commission chaired by Lord Scarman) to the recent French riots in predominantly poor, immigrant neighborhoods. John Benyon, Professor, University of Leicester, Leicester (UK). 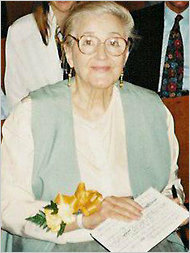 Sophie Body-Gendrot, Professor, the Sorbonne, Paris. Alan Curtis, President, the Eisenhower Foundation, Washington, DC. Jeffrey Fagan, Professor, School of Law, Columbia University, New York. Romain Garbaye, CEUMA, the Sorbonne, Paris. Fred R. Harris, Former United States Senator, Chairman, the Eisenhower Foundation, Washington, DC. Anne Power, Professor, London School of Economics and Political Science, London. Vivien Stern, Member, House of Lords, London. (Washington, DC) On December 12, 2006 the Eisenhower Foundation held the National Media Forum on Poverty, Inequality and Race. Over two dozen leading journalists, media critics and scholars spoke on these issues throughtout the daylong forum. To frame the Forum, the Eisenhower Foundation Forum had posed the question: why has the quantity and quality of print and electronic media coverage on poverty, inequality, race – and effective policy to deal with these issues – declined so precipitously since the late 1960s, in spite of recent reporting on Hurricane Katrina and failed federal policy on the Gulf Coast? Click here to view videos of the presentations. Click here for the Forum agenda and here for bios of the panelists. Click here to order a copy of C-SPAN's coverage of the event. (Washington, DC) November 6, 2006 -The Eisenhower Foundation held a day-long forum on employment training for youth, titled “The Truly Disadvantaged and the Inner City: A Return to Education, Training, and Placement.” Present at the forum were leaders from some of the most successful job education and training agencies in the United States (such as Job Corps, Youth Build USA, Vocational Foundation, Inc., Youth Opportunity Movement, Center for Employment Training, Remediation and Training Institute, and Alexandria Seaport Foundation). The forum participants reviewed the underlying principals of the former Eisenhower Foundation funded Argus job training model for youth, and, by using the LaFrance Associates’ report as a starting point, discussed best practices in youth employment education, training, and placemen that could be used to enhance the Argus model and inform development of a new job training model by the Foundation. Click to read "Findings on Youth Employment Training Best Practices" prepared by LaFrance Associates. How can we create a framework of public morality at a time when poverty has increased four years in a row, tax breaks are being given to the rich, domestic spending is being reduced, schools are becoming more segregated, and the public sector has failed New Orleans after the devastation of Hurricane Katrina? 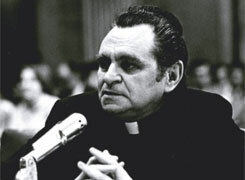 One man who dedicated his life to the pursuit of the good society was the late Father Geno Baroni, Assistant Secretary for Neighborhoods at the U.S. Department of Housing and Urban Development in the late 1970s and the highest ranking priest in the federal executive branch of the government. On what would have been Baroni’s 75th birthday, the Eisenhower Foundation held a forum on public morality that gathered more than 30 government, religious and secular leaders to discuss his legacy and explore ways it can be put to practice today. Summary of the "Baroni Principles"
Eisenhower Foundation President Alan Curtis and Trustee Jeff Faux of the Economic Policy Institute spoke at Facing Hawai'i's Future: A Gathering for the Common Good, a forum held by Faith Action For Community Equity (FACE), a local coalition of churches, labor unions, grassroots groups, tenants' organizations and native Hawaiian groups. FACE, the largest advocacy coalition on the island, represents a constituency of over 38,000 that engages in actions and programs that challenge the systems that perpetuate poverty and injustice. Curtis and Faux spoke on the growing economic rift in America and the need for proven policies that help the truly disadvantaged, issues explored in the Eisenhower Foundation book Patriotism, Democracy and Common Sense. 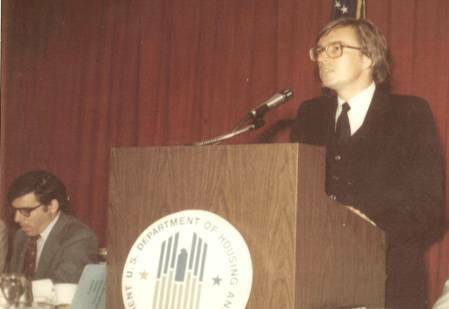 As part of the Eisenhower Foundation capacity building program, the Foundation provided critical media and organizing strategies to the coalition, helping it to achieve coverage and legislative victories on housing and long term health care. Read more about Eisenhower Foundation's capacity building inititiave. To read Alan Curtis' op-ed in the major daily newspaper, the Honolulu Advertiser. To read Columnist Jerry Burris' observations on Hawai'i's Next Social Revolution, click here. Michelle Takemoto of FACE believes that Hawai'i's Middle Class is in Trouble. To read her Op-Ed, click here. To read the Honolulu Advertiser's editorial regarding support for caregivers, click here. 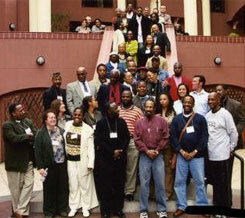 Ex-offenders and organizers convene the first national conference of Previously Incarcerated Persons at Delancey Street in San Francisco. 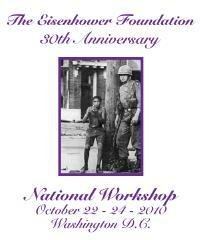 In November 2005, the Eisenhower Foundation, in partnership with the Delancey Street Foundation and more than 20 other organizations around the nation, hosted a forum in San Francisco that brought together the concerns of previously incarcerated persons in America with the warnings of President Dwight Eisenhower a half-century ago. Eisenhower's farewell address, drafted by his brother Milton, warned against the "military-industrial complex." Today, most observers agree America has a "prison-industrial complex" -- in which huge government prison-building expenditures are made as job-generating economic development grants to rural communities, disproportionately white. In response to the prison-industrial complex, the Delancey Street Foundation and the Eisenhower Foundation seek to create a national movement that empowers previously incarcerated persons, advocates for the same rights people have in other industrial democracies, expands our replications of Delancey Street, and significantly reduces the American recidivism rate. 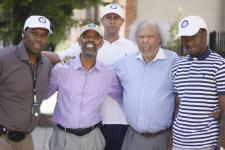 More on the first national summit of Previously Incarcerated Persons. Goodman, at left, and the Right Honourable Clare Short, MP. Crusading humanitarian Clare Short, a member of the British Parliament, has been fighting against hunger and poverty during her career in government. 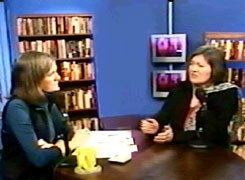 A contributor to Patriotism, Democracy, and Common Sense, Short visited fellow contributor Amy Goodman at her Firehouse studio to tape a segment of Democracy Now! recently in New York. To read a transcript of the exchange or watch the segment (at 128k stream). Our prayers go out to the victims of Hurricane Katrina, which wracked the U.S. on Aug. 29. The next day, the U.S. Census Bureau announced that a million more Americans had entered the brewing storm of poverty in America − which grew for the fourth straight year. Next year, tens of thousands of Katrina's victims may be added to the list of those who live on less than $19,300 for a year family of four. The total is now 37 million Americans, with more well on their way there. Eisenhower president Alan Curtis is featured in a nationally syndicated column by William Raspberry in the Washington Post, who writes that this fourth-year economic disaster could have been avoided – much like the catastrophic aftermath of Katrina. Read the full article. In response to the Census data, the San Diego Union-Tribune correctly observed that $19,300 can't go far for a family of four in a major city. In San Diego, the average small apartment rents for $1,210 -- or $14,520 a year. Subtract that from $20,000, and that family of four will be having a pretty lean year. Trouble is, that $20,000 is above the poverty level. This will shut the door to most poverty assistance. Experts agree that the real income needed to escape poverty in America is significantly higher than the 40-year-old federal standard. Eisenhower president Alan Curtis told the paper that "the long-term trend is to ignore the realities of the poor." For a look at what it takes for a family to really break even, please click here for the full story. After hurricanes Katrina and Rita, the state of America's poor was vividly brought before us -- the face of a nation that many of us seem to avoid until disaster strikes. As a nation consumed with the lives of the rich and famous, we rarely seem concerned about the 37 million Americans who live below the poverty level. Now will we remember these images of desperation, and work for change, or will the memories fade yet again? On the West Coast, the San Francisco Chronicle discusses the recent shift in focus toward the poor. On the East Coast, Kevin Merida and Michael A. Fletcher write of the new "celebrity poor" in The Washington Post. Eisenhower president Alan Curtis is quoted in both. Joseph C. Wilson, left, with Richard Leone, Alan Curtis, and Clare Short at Eisenhower Foundation forum Feb. 15.
policies that benefit average workers and their families. For Dr. Curtis' presentation, please click here; for Richard Leone, click here; for Joseph C. Wilson, click here; and for Clare Short, please click here. Labor and the Eisenhower Foundation came together as one April 27 at the National Labor College for a major forum based on themes addressed in new book, Patriotism, Democracy, and Common Sense. Dr. Alan Curtis, editor of the volume, was joined by noted economist Jeff Faux and Dr. Yvonne Scruggs-Leftwich, Labor College faculty member, on the panel moderated by Dr. Schurman during sometimes contentious question-and-answer. Each presenter received a standing ovation. Dr. Schurman told 55 labor leaders from around the U.S. about the foundation’s roots in the civil-rights movement. “That was your calling – the social-justice movement,” she told the authors of the book who comprised the forum panel. Curtis concluded “It is publicly immoral for a fifth of America’s youngest children to live in poverty,”. “It is immoral for America’s CEOs to earn 500 times more than America’s workers and 250 times more than its teachers”. For a transcript of the proceedings, please click here. Poverty, unemployment, poor education, racism, and the highest incarceration rates in the world remain American dilemmas that diminish the credibility and "soft power" of the U.S. in the eyes of other nations. Yet cost effective solutions exist, stressed Eisenhower President Alan Curtis in testimony given before the Congressional Black Caucus. Curtis concluded the issue is not lack of knowledge, but lack of will. "We already know what works for the truly disadvantaged and need to replicate it to a scale equal to the dimensions of the problem." For Dr. Curtis' presentation, click here. Students in Washington state have a new hurdle to clear in order to graduate -- the Washington Assessment of Student Learning. It's a hot topic among parents, and students say the test "is an unfair addition to graduation requirements." In some schools, almost half the students fail the standardized test, beginning in 9th grade. If you don't pass in your senior year, you can forget about a high school diploma. For the latest on the controversy, please click here for a new developments in the Seattle Post-Intelligencer. The Foundation, in its continuing support of youth leadership development, provided a grant to Central House of Seattle to develop a youth media project at Ranier Beach High School. The project youth decided to address some of the issues surrounding the standardized testing, producing a number of public service announcements, which led to public debate regarding the testing. Social Security Going Broke?Immigration a Problem? Rumors of the death of Social Security are greatly exaggerated, thanks in part to continuing immigration, experts said at a recent Eisenhower forum in Washington. The thoughtful analyses presented at the forum are now available in The Baby Bust: Who Will Do the Work? Who Will Pay the Taxes?, edited by former Senator Fred R. Harris. This landmark book of essays by demographic, economic, and political science experts, examines the "birth dearth" and its causes, implications, and policy options. When one looks at the Social Security system and immigration trends in the U.S., production is going to increase, not sharply drop as some predict. Wages will be going up, and as a result, the Social Security system will be as healthy as it has been in years. At a time when both Social Security and Immigration Policy are center stage in the political debate, it is important to fully understand the sometimes technical and confusing issues. For more information on the content of the book, Click Here. To order the book from Amazon, Click Here or Click the book image above. 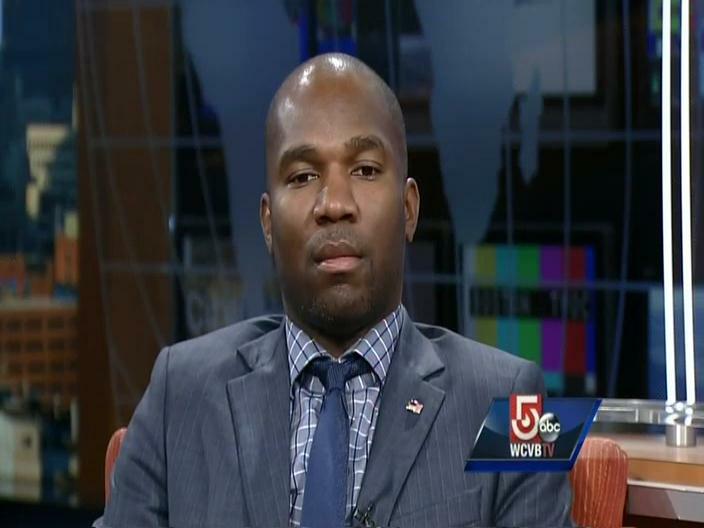 Click here to see Boston's ABC Station WCVB-TV Interview from July 13, 2013. Click here to read about the New Bedford Quantum Associates visit to Washington, D.C.
Click here to read Jason Perry's article "Quantum's light shines brightly" from The Standard Times, Apr 27, 2013. Click here to read Lauren Daley's article "Quantum students take leap toward their futures" from South Coast Today, May 13, 2013. Click here to read what Officer Quinise Green says in the Baltimore Sun about how a Police mentoring program provides a lifeline to youth in need. Click here to read what Lauren Daley says about the success of the Quantum Opportunities Program in New Bedford. Click here to read what Aurelio Sanchez says about the academic turnaround of the Quantum associates in Albuquerque. Click here to see what WBLT-TV3 reporter Mike McDaniel says about the Eisenhower funded program in Jackson. Click here to watch the WEW-TV5 news coverage of the program grand opening. Eddie Banks of the Eisenhower Foundation speaks during a program to announce a groundbreaking community based initiative designed to help at risk middle school youth. In the background is Lester Sanders, Youth Safe Haven Program Director. Click here to read the CantonRep story. Click here to read what Juan Carlos Rodriguez says about how the Quantum and Argus Programs Aim To Cut Dropouts in the Albuquerque Journal. The pictures above are from the open house hosted by Youth Development, Inc. of Albuquerque, NM, celebrating two new programs funded by the Eisenhower Foundation. In attendence were Mr. Chris Baca, YDI President/CEO; Concha Cordova, YDI Associate Director, Education, Employment & Training Division; Veronica Martinez, Constituent Liaison, for U.S. Representative Martin Heinrich; Sara Cobb, representing Senator Tom Udall; Patrick Newman of the New Mexico Workforce Connection, Central Area Workforce Investment Board; and representatives of the Quantum and Argus programs. 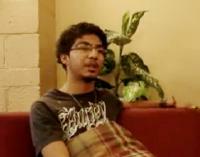 Click here to see the Youth Safe Haven in action. Click here to read the Toledo Blade's edictorial on the importance of Learning after school in settings such as the Youth Safe Haven. Click the photos for larger pictures. 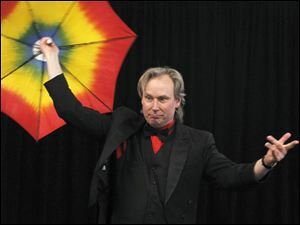 A magic show was held Feb. 23, 2001, at the James C. Caldwell Center. Click here to read what the Toledo Blade says. Click here to see coverage by WTOL. 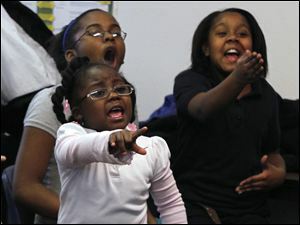 After-school initiative in Irvington keeps kids off the streets with lessons in art, dance. Click here to hear Mayor Wayne Smith talk about the importance of mentoring. Congressman Elijah E. Cummings (at podium) talks about the Eisenhower programs in Baltimore. Click here to read the Baltimore Sun article by Yeganeh June Torbati. Click here to read the AFRO story by Shernay Williams. Click here to see what WBAL-TV says about the program. Click here to see what Fox45 says about the program. The Tuskegee Youth Safe Haven and Police Mini-Station celebrated a grant award from the Milton S. Eisenhower Foundation on Thursday, an event that featured the program's participating families, mentors, and all those who helped make the program what it is today. Click here to read the story by Mark Okarmus in the Montgomery Advertiser. Click here to see what TV12 says about the Youth Safe Haven program. Click here to read what Adam Beam says about the program in The State. (Providence, RI) February 3, 2011 - Fifty children from the Olneyville, Hartford, Silver Lake and Manton neighborhoods are participants in an anticrime/social services program called Youth Safe Haven, for children 6 to 12 years old, that gives them after-school refuge in the brightly decorated Thomas J. Anton Community Center at the Hartford Park public-housing project. 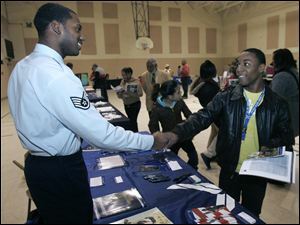 (New Bedford, MA) January 29, 2011 - Students at New Bedford High School will be served by a new Quantum Opportunities Program, a partnership between NorthStar Learning Centers, the city's school system and the Eisenhower Foundation. Read the story by Charis Anderson. 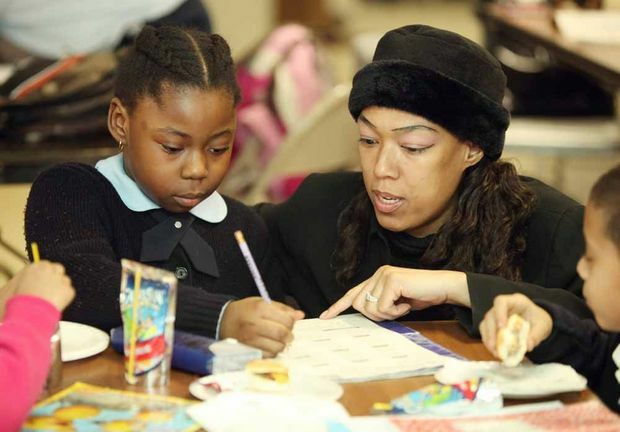 A new after-school program is up and running in New Bedford. Click here to read what radio station WBSM-AM says about the program. Click here to read what Treehugger.com has to say. 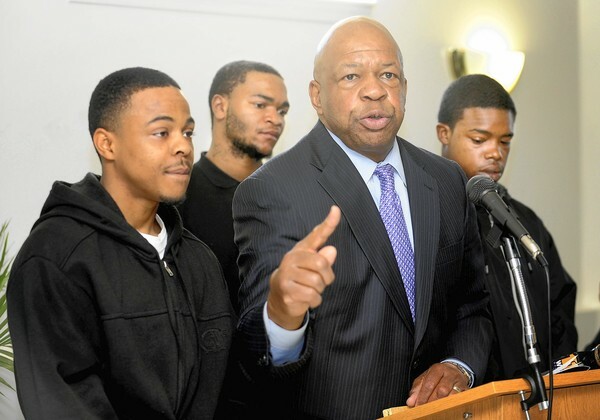 (Oakland, CA) January 25, 2011 - With only 35 percent of Oakland's African-American boys graduating from high school, an Eisenhower sponsored Youth Safe Haven mentoring program is hoping to reverse the trend in one of the cities toughest neighborhoods. Click here or the photo above to watch the news coverage from San Francisco ABC7 News. Click here to read the story by Cecilia Vega. 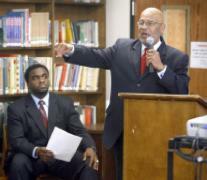 (Oakland, CA) January 26, 2011 - City, school leaders aim to turn a violent area of Oakland into a safe haven. Click here to read the story by Katy Murphy. (Des Moines, IA) January 8, 2011 - The Eisenhower Foundation is supporting Spectrum Resources of Des Moines, a group that works with former offenders and other hard-to-employ people. With funds from an appropriation by Sen. Tom Harkin, a $250,000 grant will support green-jobs training. (Milwaukee, WI) November 20, 2010 - The Eisenhower Foundation has selected the United Community Center to receive a $405,000, three-year grant to operate its Quantum Opportunities Program, a comprehensive youth development program that provides educational, development activities, community service and financial incentives for students in grades 9-12. 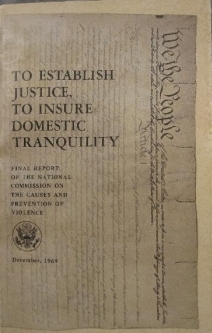 With multiyear funding from the United States Department of Justice and other sources, the Foundation is replicating twenty new programs across the nation - in Albuquerque NM, Baltimore MD, Boston MA, Columbia SC, Des Moines IA, Irvington NJ, Jackson MS, Milwaukee WI, New Bedford MA, Oakland CA, St. Petersburg FL, San Juan PR, Toledo OH, and Tuskegee AL. See the Justice Department press release. See the Foundation's listing of the Executive Directors and Program Directors of the nonprofit organizations replicating the models - Safe Haven Ministations, Quantum Opportunities and Argus Learning for Living. 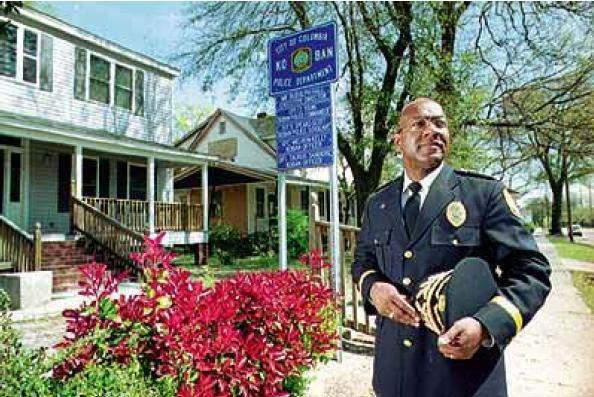 The city of Columbia, SC has been a partner with the Milton S. Eisenhower Foundation since the mid 1980’s and has received vast coverage of its’ successful implementations of the Youth Safe Haven-Police Ministation programs. The program is starting the implementation of the a new Youth Safe Haven in the Hammond Village section of Columbia. The program will partner with Benedict College, Village of Hope, the Columbia Public Housing Authority, the Columbia Police Department and the Developing Responsible and Mature Adolescent program. The Safe Haven is operating out of Parkway Recreation Center adjacent to Berkeley Terrace Elementary School. In addition to an experienced director, all other civilian staff are certified teachers and the police are providing an officer that is experienced with youth, problem oriented community policing and the Safe Haven model. Click here to read the story about the program's grand opening by Richard Khavkine of the Star-Ledger. The Eisenhower Foundation will be working with Operation Shoestring to offer mentoring for students of Galloway Elementary School and Northwest Middle School, and problem oriented community policing for all residents of the neighborhood. The Youth Safe Haven in Oakland serves the Havenscourt-Lockwood area, including Lockwood Gardens and Lions Creek. This program is a joint effort of the Foundation, Safe Passages, the Oakland Unified School District (OUSD), the OUSD Police and the Oakland Police Department. Click here to watch the news coverage from San Francisco ABC7 News. 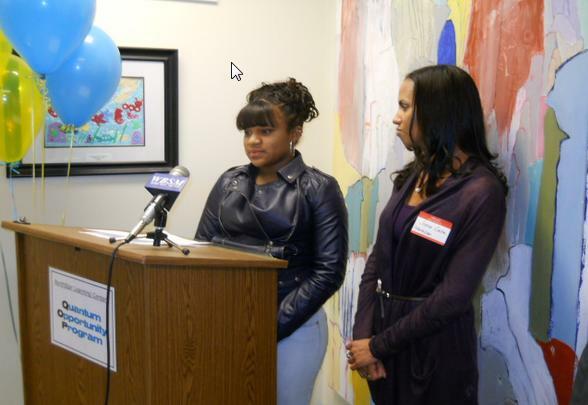 Click here to see KTVU coverage of the grand opening. The Safe Haven Ministation program is located in the Hartford Park Community. The police assigned to the safe haven have 12 hour shifts that allow for coverage of the program when the safe haven is open but also allows for covering the community once the safe haven is closed for the day. The police have an excellent opportunity at problem oriented community policing success with this type of schedule. One of the highlights of the Providence program is their partnership with Rhode Islanders Sponsoring Education (RISE), a state-wide mentoring initiative that has allowed for one-on-one mentoring for the Providence Safe Haven youth. Click here to read Gregory Smith's article about the grand opening in the Providence Journal. The Youth Safe Haven is under the guidance of Centro Sister Isolina Ferre, which has been a partner with the Milton S. Eisenhower Foundation since the mid 1980s and has survived two major storms and other difficulties to remain a beacon in the community of Caimito. The program is staffed with a very professional group all degreed in service provision. What is exciting about the San Juan program is that by June, 2011 the Centro will open a new facility that will house the Safe Haven Ministation as well as provide services to the entire community of Caimito. The Safe Haven Ministation is a new member to the family located in the North Toledo section of the city and under the administration of the James C. Caldwell Community Center. 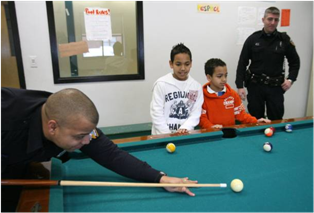 The safe haven program advances positive youth development by incorporating after school and summer tutoring, life skills, mentoring and social enrichment programs under the guidance of civilian and police staffing. 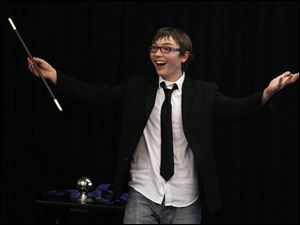 Click here to read what the Toledo Blade says about a recent magic show at the site. Click here to see coverage of the grand opening by WTOL. 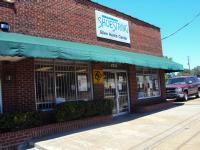 The Safe Haven Ministation in Tuskegee receives support from a number of local partners. The Tuskegee Housing Authority is providing support through the use of a 5 bedroom unit, program transportation, building maintenance, accounting services, and a program liason/assistant. 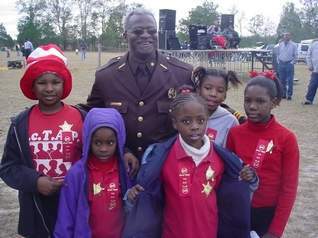 The Tuskegee Police Department is providing an on-site police officer, but also regular patrol officer visits with the youth and program support for Safe Haven activities. The Macon County Sheriff’s Department is making deputies available for program activities and assistance with Safe Haven programs. The Alabama Cooperative Extension System (Auburn University/Alabama A&M University) has committed Extension Agents to the Safe Haven program; and Tuskegee University has provided a variety of support from its various departments, schools and programs, there has also been support from the University’s student body. City of Tuskegee Summer Feeding Program provides free offsite nutritional meals for breakfast and lunch each week of the Safe Haven Summer Camp program. 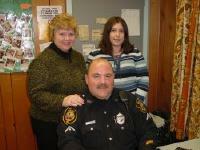 Other agencies have committed to make their services available through referrals, counseling and onsite training. These include: East Central Alabama Mental Health Inc., Macon County Juvenile Probation Department, Alabama A & M University and the Macon County Board of Education. Click here to read the story of the recent celebration by Mark Okarmus in the Montgomery Advertiser. Quantum serves the students of West Mesa High School. While the Quantum Associates, as the participants are known, are all Hispanic, some are from old New Mexican families that have been in the area for several generations and others are from families who have immigrated more recently. In addition to traditional Quantum activities, special attention will be focused on technological literacy and the use of media production to enrich learning. Click here to read the Baltimore Sun article on the grand openings by Yeganeh June Torbati. 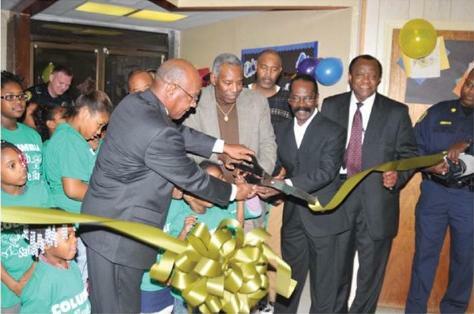 Click here to read the grand openings' article by Shernay Williams for the AFRO. Click here to see what WBAL-TV says about the programs in Baltimore. 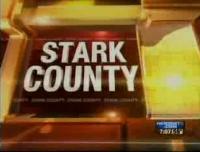 Click here to see what Fox45 says about the programs. True to the original Quantum model, Milwaukee is focusing on education and preparation for college, including working toward receipt of scholarships. Even skill development activities will have an academic component. 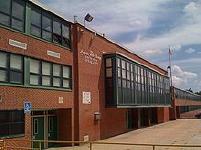 The newest Quantum site, it serves the youth of New Bedford High School, an ethnically and racially diverse school. Read the story of the grand opening by Charis Anderson. The Quantum replication in St. Petersburg is working with both Gibbs High School and St. Petersburg High School. With youth most at risk of being involved in problem behaviors during the after-school hours, the youth of St. Petersburg are particularly at risk, because school begins early and concludes at 1:00 PM, giving the youth an extra two hours of high risk time. The most diverse of all current Eisenhower Foundation supported Quantum programs, the Associates of the program are being exposed to many opportunities from which the youth of low income communities are often excluded, such as the Dali Museum. The Toledo Quantum program is located at the Caldwell Community Center, across the street from Woodward High School, the academic partner for Quantum. In addition to the proximity of facilities, the Caldwell Community Center has a long history in the diverse community, having been founded in 1904. Argus in Albuquerque works with Central New Mexico Community College to provide young high school dropouts with the training necessary to have a career web that will include opportunities in photovoltaic (active solar) panel installation and manufacturing, as well as potential advanced training as apprentice electricians. The Druid Heights area of Baltimore is undergoing a renewal, thanks to the efforts of the Druid Heights CDC. The Argus program, which will assist local youth in getting their GED and job skills training in housing renovation, will play a key role in this renewal. Mayor Thomas M. Menino talks with J’Shaun Reddick, who is part of a group of local Argus youth helping the city maintain foreclosed properties in Roxbury, Dorchester and Mattapan. The Dorchester Youth Collaborative, working with Dotwell and College Bound Dorchester, is providing job training opportunities for youth in an area where gangs are a formidable barrier to any youth program. The program will work with an extremely diverse group of young drop-outs: African American, Vietnamese, Cape Verdan, West Indian and others, both male and female. In addition to work on their GEDs and job skill training, the program youth will receive wrap-around services to help them overcome any barriers that they may face as they work toward jobs with a future. (Washington, DC) March 11, 2009 - Jennie Amison, Eisenhower Foundation Director for Ex-Offender Programs and Executive Director of Gemeinschaft Home testified before the House Appropriations Subcommittee on Commerce, Justice, Science, and Related Agencies, chaired by Congressman Mollohan of West Virginia. 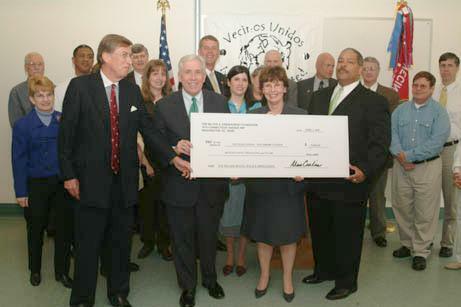 (Herndon, VA) April 24, 2007 - Vecinos Unidos, the Eisenhower Foundation's partner in replicating the Quantum Opportunities Program and Youth Safe Haven in Herndon, VA, celebrated it tenth anniversary. Vecinos Unidos continues to address the educational needs of local youth and has worked with the Eisenhower Foundation since 2001. Click here to read the article from the The Fairfax County Times. (TOKYO, Japan) Feb.1, 2007 – In the early 1990s, the Eisenhower Foundation looked to Japan when developing the Koban – Youth Safe Haven model. Now Japan is looking to the Foundation for help reintegrating prisoners into society. Jennie Amison, Director of Replications for Previously Incarcerated Persons at the Eisenhower Foundation and Executive Director of Gemeinschaft Home spent two days lecturing and speaking with officials in Japan about the successes of the reentry program she runs in Harrisonburg, VA.
(Washington, DC) December 21, 2006 - Charlene Coleman is a mother of two sons in the troubled Carver Terrace neighborhood in Washington, DC. Ms. Coleman writes about how the Quantum Opportunities Program and Youth Safe Haven help give her children a better future. For a number of years, students, families and the community have been served by the General Smallwood Middle School full-service community school. Click here to read what the Maryland Independent newspaper says about the program. 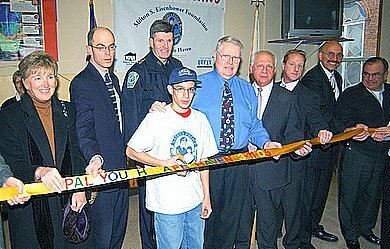 January 22, 2007 - Officer Anthony Macaione received the award for Outstanding Law Enforcement Officer for his ability to act as a mentor and role model as the department's housing officer. "He has won the hearts of many children who have gotten the chance to see a police officer as something more than a cop with a gun," Bolduc said, reading Macaione's nomination from police. Macaione said this was the first time he's received an award of this magnitude. He added he could not have done it without the support of the Rochester Housing Authority, Rochester Youth Safe Haven, fellow officers of the Rochester Police Department and his family. Click here for the story. 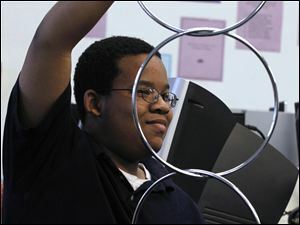 Mike Smith, 14, tries to spell a word during a word game at Harding Middle School's summer school program on Tuesday. (Des Moines, IA) July 19, 2006 - "Early in the morning, 40 or more east-side kids in Des Moines tumble out of their summer slumber and hop on the bus or travel otherwise to Harding Middle School." This Full Service Community School is helping kids raise their grades. Read the story. Read what a previous evaluation said about the impact of the program. (Honolulu) June 13, 2006 - "The Eisenhower Foundation has worked for 25 years to bring solutions to the many problems facing this country's disadvantaged communities. Now, it hopes to bring more of its solutions to Hawai'i." Read Michelle Takemoto's commentary. Graduates of the Quantum Opportunities Program traveled to Mississippi in May for their graduation trip. Students and advisors helped with the ongoing clean-up of the area affected by last year’s devastating hurricanes. (Dover, NH) July 21, 2006 - Since 1994, Seymour Osman Community Center (SOCC) has served as a home away from home for Dover youth. 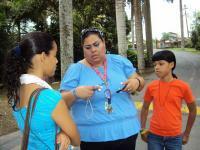 Not only do the youth's grades improve by participating in the project, but they also learn the importance of service. Read more about the success of the programs. (Dover, NH) June 28, 2006 - Members of the Quantum Opportunities Program recently journeyed from Dover, NH to Mississippi to construct and deliver storage pods to hurricane victims. Read the story. 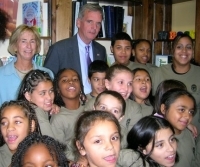 Senator Judd Gregg and Nashua Youth Safe Haven participants at the dedication of the "Senator Judd Gregg Library." 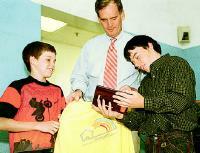 (Nashua, NH) October 16, 2006 - The Nashua PAL Youth Safe Haven recently dedicated its new library to Sen. Judd Gregg, who has long supported Eisenhower Foundation programs in New Hampshire. The library, with $2,500 worth of donated books, will help participants learn the importance of literacy. Read articles about the event from The Nashua Telegraph and The New Hampshire Union Leader. Senator Judd Gregg (R-NH) welcomes youths from the Nashua Youth Safe Haven Program. This is the second group of program youths to visit Washington DC this summer. Many of the youths are recent immigrants, who are learning first hand about their new home. 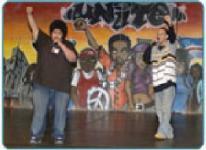 (Lancaster, PA) June 26, 2006 - Lincoln Middle School partners with agencies in a “community school” concept that helps kids cope with poverty, violence and other issues. 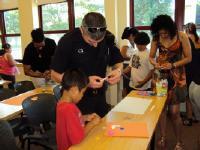 Read how this program is helping the kids, the parents and the community. 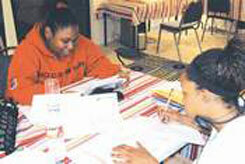 (Herndon, VA) June 15, 2006 - "When Herndon’s Quantum Opportunities Program, a four-year after school tutoring program for Herndon High School students with below average grades, was launched, no one, not even the program’s founding director, thought that they would be able to help their students turn their academic lives around." Now 17 of 20 students are graduating. Read about the tremendous success. (Dover, NH) June 2, 2006 - There can be no doubt about the success of the Quantum Opportunities Program in Dover New Hampshire, according to an Op-Ed that appeared in Seacoast Online. 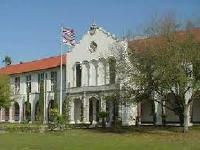 Not only did the original group of students benefit, but local sources provided funding for additional students to participate. Read about the exciting outcomes of this four year program. (Dover, NH ) May 29, 2006 - Four years ago, a group of at-risk students, with a low probability of graduating high school, joined the Quantum Opportunities Program. Now they are graduating and several are heading to Waveland Mississippi to lend a hand in the Katrina cleanup. 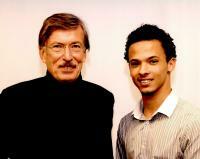 Read about the success of these young people. The violence that once got this corner of DC the nickname 'Little Vietnam' is the home for successful youth programs, but they need help from the city. Read about these programs and what they need to succeed. 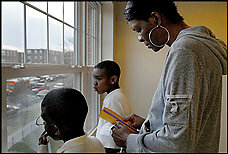 (Herndon) April 13, 2006 - The Eisenhower sponsored Youth Safe Haven in Herndon, Virginia, is celebrating its first anniversary serving a diverse population of local and immigrant youths. Read the story here. (Herndon) February 13, 2006 - Quantum Opportunities after school program comes to an end as Herndon High School seniors prepare for graduation. 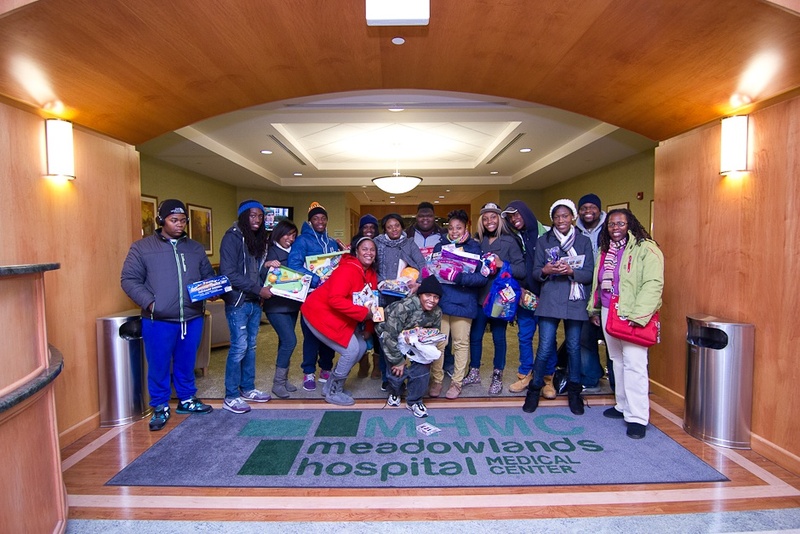 Read more about the success of the program in the Herndon Connection Article. Recently, the Foundation brought educators and parents from full-service community schools across the country together in western Pennsylvania. The East Allegheny Middle School, an Eisenhower Foundation-funded full-service school, were gracious hosts to our Sixth National Cluster Workshop. The theme of the workshop was "Sustaining our Work-Creating Structures of Permanence." Around 50 participants shared their experiences and listened to speakers from other successful community schools. 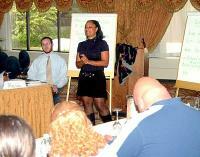 To read an article from the McKeesport Daily News about the workshop. The Nashua, NH PAL (Police Athletic League) opens a new Youth Safe Haven: from left to right is Debora Pignatelli, Executive Councilor; Matt Lahey, Assistant to Sen. Judd Gregg; Chief Timothy Hefferan of the Nashua Police Department; Mayor Bernie Streeter; Joseph Guliano, Superintendent of Schools; Joseph Laplante, Nashua PAL Board of Directors; Christopher Faye, Eisenhower Foundation; Mike Green, NH National Guard. Cutting the ribbon is Aldonys Reyonoso. Students in Nashua, NH, have a new place to go after school – a new Youth Safe Haven sponsored by the Eisenhower Foundation at the Police Athletic League there. It will be a cooperative effort involving local police, the Nashua School District, the Nashua Housing Authority, and the New Hampshire National Guard. Many local notables turned out for the ribbon cutting in March, including the mayor, police chief, and others. For the story, please click here. U.S. Senator Judd Gregg was on hand at the Seymour Osman Community Center in Dover to receive the Champion of Children award. The Eisenhower Foundation funds programs in three New Hampshire communities: Rochester, Dover, and Somersworth. See Full Story. Leila McDowell, Director for Capacity-Building Replications, helps participants to become more media savvy -- and thus more effective with members of the news media. The Eisenhower Foundation theme of “Multiple Solutions for Multiple Problems” was on demonstration at the famed Watergate Hotel in Washington D.C. in June as the foundation hosted more than 60 partners from around the country to the National Cluster Workshop on Youth Safe Haven and Quantum Opportunities Program replication initiatives. While the three-day workshop was designed to focus on youth safe haven/police ministations on the Quantum Opportunities program for high school youth, participants also took part in panel discussions on grant writing, media training, effective youth development strategies and better policing in public housing. “These people represent the front-line of Eisenhower programs around the country,” said Johnnie A. Gage, Eisenhower Foundation COO. “The forum gives participants the opportunity to share their experiences and problem-solve," he said. "We want to act as a clearinghouse to impart information and discuss lessons learned.” Please click here for scenes from the workshop. Congressman Frank Wolf holds a $75,000 “check” from Eisenhower CEO Alan Curtis, left. At right is Vecinos Unidos president Chris Griffin and Herndon vice-mayor Darryl Smith, far right. HERNDON, Va. (April 1) – The Milton S. Eisenhower Foundation, with the help of U.S. Rep. Frank R. Wolf (R-Va.), opened a new Youth Safe Haven here today – with the twin goals of improving academics and giving young people an alternative to street gangs. For the full story, click here. Previously, Congressman Wolf had joined Eisenhower Foundation staff, Herndon police officials and students from Herndon High School to celebrate the opening of the Quantum Opportunities Program there. Above, Congressman Wolf and Dr. Alan Curtis, Eisenhower CEO, discuss how the Quantum Opportunities Program will help Herndon's high-school youth with its four-year, computer-based model. 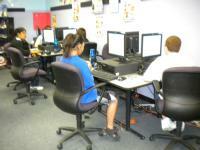 Below, Some of the youth being helped by the Quantum Opportunities program. It was a beautiful day to celebrate a remarkable public-private partnership effort between the Eisenhower Foundation and Telesis Corp., despite the early threat of rain. The Rev. Terry O. Corbin – brother of the late “Miss Patsy” Hartsfield – prepared to make his introduction while about 60 audience members enjoyed the fine weather. 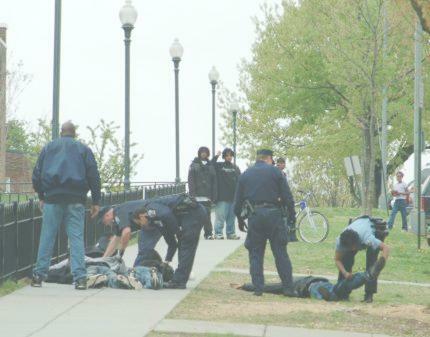 Then, about 30 feet away at the intersection of 21st and Maryland NE, three police cruisers broke the stillness of the morning by converging at once, tackling three young pedestrians and handcuffing them, face-down on the ground. It was as if circumstances converged to underline – in bold – the urgent need for the Youth Safe Haven that Eisenhower established at Carver Terrace two years ago. 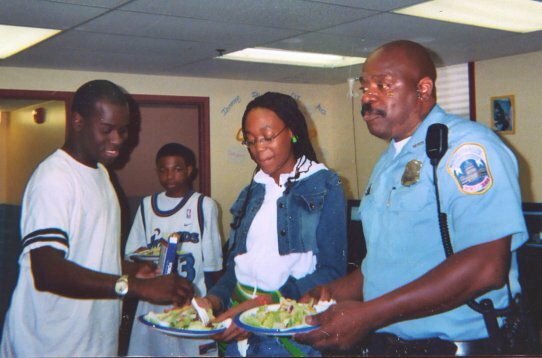 With much fanfare and song, the Eisenhower Foundation opened the nation's newest Youth Safe Haven-Police Ministation in Washington D.C.'s Carver Terrace complex in 2003. The gathering, covered by both of Washington's daily newspapers, attracted community members including Virginia E. Hayes Williams, mother of Washington D.C. Mayor Anthony A. Williams, police officials and Eisenhower Foundation staff members. For teens in poor communities, The Eisenhower Foundation is replicating the Quantum Opportunities Program, for at-risk teenagers that has won the praises of education experts, policymakers and The New York Times. The program offers academic tutoring, computer based learning, stipends and money towards college. Initially, Quantum will be replicated in New Hampshire, South Carolina and Virginia. 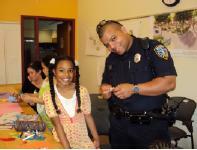 The service components of the Youth Safe Haven/Mini-Police Station programs are based largely on a theoretical framework known as Positive Youth Development, which focuses on the developmental needs of youth and building the assets that are required in order to make a successful transition to adulthood. Read our recent report on this program which provides an overview of positive youth development theory and shows how it is related to major features or strategies that serve as a foundation for effective programs. "Community schools" or "full-service community schools" are partnering with private non-profit agencies to provide whatever services people need, from GED and job training classes to family therapy, homework help, and after-school programs. An obscure Japanese import, the Koban, is racing across America -- reducing crime and increasing safety along the way. Reggie serves potluck with Cpl. Alfred Stewart at the Carver Terrace housing community in northeast DC. Reginald Grant is one of many people who make Eisenhower Foundation programs run on time. Reggie is site director for the Carver Terrace Youth Safe Haven-Police Ministation in Washington, DC, as well as its Quantum Opportunities Program. To find out why Reggie is so remarkable, please click here. 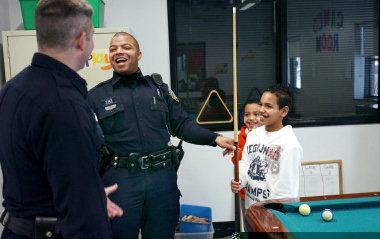 It takes a special kind of police officer, like Tony Triano, to work with kids as their primary job. Though a promotion means he isn't working directly at the site, he still contributes to the welfare of the youth. To find out more about one of the dedicated officers that have worked with Eisenhower Youth Safe Haven / Police Ministation programs, click here.